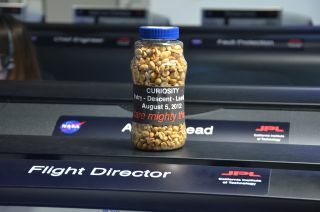 A bottle of peanuts, labeled in part "dare mighty things," is ready and waiting for the landing of NASA's Curiosity rover on Mars on Aug. 5, 2012. The peanuts are part of a long-standing tradition at the Jet Propulsion Laboratory in Pasadena, Calif.
PASADENA, Calif. — On NASA's long checklist leading up to the landing tonight (Aug. 5) of its Curiosity rover on Mars, most of what is remaining to do is handled completely by the spacecraft's on board computers. The 10:31 p.m. PDT touchdown at Gale Crater (it will be 1:31 a.m. EDT, 0531 GMT) will require the Mars Science Laboratory (MSL) spacecraft that is carrying Curiosity to slow itself down from a blazing 13,000 miles per hours to just 2 miles per hour (21,000 to 3 kilometers per hour) to safely deposit the nearly 1-ton, six-wheeled rover on the surface. To do so, MSL will need to autonomously fire thrusters to steer through its entry into the Mars' atmosphere, deploy a supersonic parachute, fire eight retro-rockets and then, as it hovers 66 feet (20 meters) above the Martian surface, lower Curiosity on cables — a "sky crane" — to a landing. The descent stage will then need to safely separate from the rover, flying to a crash landing at least 500 feet (150 meters) away. Back on Earth, at NASA's Jet Propulsion Laboratory (JPL) in Pasadena, Calif., the MSL flight team will have little to do but wait for signals from the rover — relayed through another NASA spacecraft orbiting Mars — to confirm that each critical stage of the entry, descent, and landing has gone as expected. He will pop open and start passing around the peanuts. "We have plenty of peanuts. The mission manager usually assures that we don't run out," said Arthur Amador, MSL's mission manager. The Mission Support Area at NASA's Jet Propulsion Laboratory in Pasadena, Calif., is shown in this panorama, ahead of the Mars rover Curiosity landing. The room will be the hub of activity on Aug. 5, 2012, as mission team members monitor the careful and intricate entry, descent and landing Curiosity on Mars. As Curiosity finds its way to the surface of Mars, the team will find time to reflect on how they got to this point in history. "It's traditional to take a deep breath when we finally get there, and reflect a little bit on how far we have come and where we are," said Amador in a pre-landing media briefing held on Saturday. "I think there is a moment of joy and a moment of reflection as well." Those moments can seem to take longer than they really are, added deputy project manager Richard Cook. "Time seems to have a weird sort of rhythm on that last day, where it goes real slow for a long time and then in the last 15 minutes, it goes like that," Cook said, snapping his fingers. "All of a sudden it is upon us." That experience is not unique to those inside the control room. Clara Ma, who at age 12 entered and won a NASA essay contest to name the rover, said as Curiosity nears Mars, "everything is getting more and more real." "And I am getting really, really nervous, too," Ma, now 15, told collectSPACE.com. Curiosity doesn't only carry the name Ma selected, but her name as well. As part of her prize for winning the contest, Ma has the opportunity to add her signature to a panel that was then installed on the rover. "I hope everything goes well, because knowing that my name is out there in space right now, and going to be soon landing on Mars — I can't even wrap my mind around it," she said. "When I was younger, I was like 'That's so cool, it's going to Mars!' but now it's actually so much more than that. It is like a part of me going to Mars." collectSPACE.com will provide live coverage of the Curiosity rover landing, Aug. 5-6, 2012, from NASA's Jet Propulsion Laboratory (JPL) in Pasadena, Calif. Follow collectSPACE on Facebookand Twitter @collectSPACE and editor Robert Pearlman @robertpearlman. Copyright 2012 collectSPACE.com. All rights reserved.